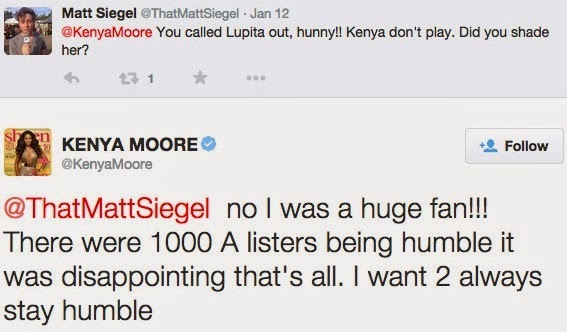 Former Miss USA and Real Housewives of Atlanta star, Kenya Moore called Oscar winning actress Lupita Nyong'o out on twitter two days ago for refusing to take a photo with her when they met at a Golden Globes after party. The epic snub was revealed after a fan asked Kenya who she hung out with at the party. why did she act like this! After two movies? Well, OK! But maybe she didn't recognize you? If true, not nice Lupita!